Physical Therapy Diagnosis: Do We Need Physical Therapists or Algorithms? Do We Need Physical Therapists or Algorithms? "Do you use Treatment Based Classification algorithms?" I asked my friend in Florida. "Why not?" I asked. " 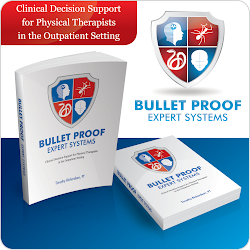 If I use an algorithm, where's the need for the physical therapist?" was her final answer. My friend is a busy, private practice owner who is well-respected for her focus on the patient and her clinical skills. Physicians, too, resist using computer algorithms to inform treatment decisions for similar reasons. I've discussed this trend before, most notably in response to the surprising results at the Oxford Debate at the 2011 American Physical Therapy Association Annual Meeting in Washington DC where student physical therapists lead the room AGAINST clinical decsion rules. Now, Vinod Khosla, tech investor and CEO of Sun Microsystems, questions whether Do We Need Doctors or Algorithms? Essentially, Vinod's argument boils down to the fact that computers and computer algorithms are faster, cheaper and less likely to make a mistake. Humans, on the other hand, are non-perfect and non-perfectable. The odds are against physicians and physical therapists if we try to pit human productivity and human efficiency against machine productivity and machine efficiency. But, healthcare is NOT just productivity and efficiency. Healthcare is also caring. "...the role of humans as the most important factor in production is bound to diminish in the same way that the role of horses in agricultural production was first diminished and then eliminated by the introduction of tractors". I think physical therapists are in good position to incorporate decision algorithms into our practice WITHOUT losing jobs. "…operating on the alien logic of probabilistic statistics - a matter of likelihood rather than certainty....our brains aren’t wired to think in terms of statistics and probability. Physical therapists are among the most trusted of healthcare professionals. Besides, we work with our hands and we still touch the patient. I don't think Vinod has an algorithm for that.